So, you have this really cool game. It’s exciting. It hits the table all the time. You and your group have a great time playing it and create fun memories. You play it so much, in fact, that you wish you could get more of it! Now, sitting there on your shelf next to that awesome title is this other game. It looks like it should be a blast. It has solid mechanics, or maybe an interesting theme, or otherwise shows promise. But it’s just missing something that you can’t quite put your finger on. Then one day while strolling through your friendly local game store, you find that both of these games have an expansion. Great, you think! One to add even more fun to your glorious favorite, and one to give that other guy a second chance. It’s soooooo tempting to buy both of them, right? Don’t do it! Because expansions are bad and here’s Why, Why, Why?! Expansions are just plain unnecessary. The way I’ve heard it, there are three major reasons for making and getting an expansion. One, it adds more awesomeness to an already awesome game. Two, it fixes something inadequate about the base game. Or three, it rejuvenates a design that has grown stale over repeated plays. Reason #1 will of course always be highly subjective, and I already addressed that idea with my first point above – spend your money instead on something new and different and fresh. The second reason is actually a horrible motivation to buying an expansion. If the original design really did have some fault, shortfall, or broken element, why should you invest even more money to patch it?! Finally, if a game has a lost is allure over time, that likely speaks to a greater issue of replayability. An expansion will probably indeed inject some new life into that design. At least for a while. But all of those Ticket to Ride and Power Grid maps will soon lose their luster, just like the original. When is it enough? Expansions are a bad philosophy. As a corollary to the points above, if an expansion is really worth making, then the best practice is to put it in the game from the start! Now, you may be saying, “But they didn’t think of it before making the base game.” Nonsense! Game designers are bright, intelligent individuals who have brilliantly tinkered so much with their creation that there’s plenty more they’ve thought about beyond what’s in the published release. Now, I’m not a conspiracy theorist accusing designers and publishers of behind-the-doors shenanigans to milk us all of our money – except, of course, at those times when I am. But when new titles are released with inserts obviously designed for future stuff, it’s clear that expansions are not just an afterthought.Or, maybe you argue, “It would be cost prohibitive to produce all of that in the base game!” Well, perhaps, but they end up getting produced one way or the other. And you’ll spend the money for them all whether you buy them over time or in one fell swoop. Besides, the added cost is only one drawback to expansion material. All of the extra components and rules only add complexity, length, and fiddliness to what was generally a fine game to begin with. And if it wasn’t, well, then see point #2 above. My arguments against expansions aren’t about being in the “Cult of the New.” That’s more of a neurosis in which one needs every bit of the latest hotness or trendy sellers. Instead, mine is about simple diversity and creativity. Don’t get more of the same. You, your game group, and potential newbies that you can bring into the hobby deserve the spice of life in your gaming! So, yes, expansions are bad for the hobby. Without demeaning my well-reasoned and professional editorial by mentioning specific names *coughDominioncough* or going on forever and ever *coughSettlersof Catancough*, I encourage you to resist the chains of expansions *coughAscensioncough*. They’re too costly for the value they add *coughAlhambracough*, unnecessarily or ineffectively add anything of important worth to the original *coughMunchkincough*, and are a bad design philosophy *coughAgricolacough*. My good man Jason is well intentioned; in fact, in many ways, our general gaming tastes overlap. Yet never before has he been so wrong, wrong, wrong about something. The truth is, expansions are not just “not bad” for the hobby, they are probably one of the BEST things for the hobby. I’m here to tell you that expansions are great and here’s why, why, why! Expansions introduce complexity slowly: Probably the biggest barrier to entry into the board gaming world is the fact that people just don’t know how to play these games, and that is intimidating. That’s why we have gateway games – games that are easier to learn but still fun, to just get people started. Once people learn one thing, they can build off that to learn more and more complex games. Expansions allow the gradual introduction of increased complexity in a familiar environment – players already KNOW the base game, so it’s much less intimidating to add on a few extra rules to the core, familiar experience. This, in turn, gives them more knowledge and experience to make OTHER games easier to learn, since these players are now familiar with more concepts common to many games. But you don’t want to pack all the options in one box; a new player pulling out the game will be highly intimidated by all the extra rules; what to include and when, and why? Let them buy a game, learn to play it and love it, and then invest in expansions. Expansions make your games better: Lets face it. The core box of pretty much every game ever made will grow stale if played too often. Some games have an inherently longer life than others, but it’s just going to happen; a game will become less interesting over time. What my counterpart argues is that you should just buy more, unique games, but he forgets something important; as reviewers, we seek to play every game we possibly can, but many people have smaller collections and focus on just a few games. More casual players like to dig into a single game for many, many plays. Expansions allow them to show love to their favorite games, to increase their options and complexity and ways to play. It adds variety and life, preventing a game from growing stale, and that is important to people who just aren’t interested in buying every game under the sun.Expansions are also opportunities for game companies to respond to the community. During development, a game can only be tested with what, maybe hundreds of different people at best? Problems will slip through. Releasing a game into the wild exposes it to THOUSANDS of players, and publishers are sure to discover more problems, or things that aren’t even problems, just preferences of the gaming community – and offer solutions and more gameplay variety in a new box. I have plenty of games that I loved from the start, but new expansions added new ideas and possibilities that made the game even better. Expansions are cost-effective for EVERYBODY: As I said before, many casual gamers tend to focus on one or two games rather than building an extremely broad collection. 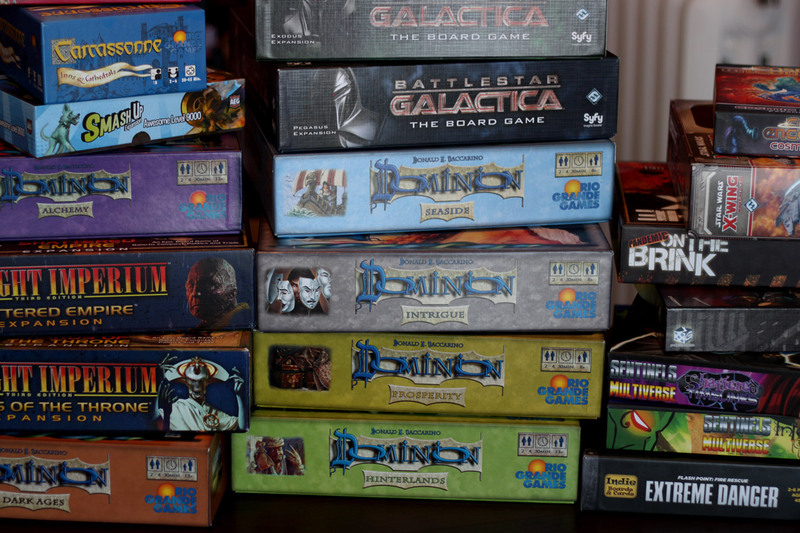 Expansions are generally cheaper than the base game, so expansions allow players to expand their collection based on what they love, which will cost less than trying to buy the same number of boxes of brand new games. Comrade Jason suggests that publishers should just pack everything into one box because you’ll buy it all anyways, but that is false. There are many games that I have expansions for, but there are some that don’t, because I don’t enjoy those games as much or play them as often. If every expansion had to be contained in the first box, I would have to buy it all, no choices, and it’s going to cost more not just for components but for extensive testing of all those rules. Breaking things out into expansions lets me choose which games I want to really invest in, and which games I just want to stick with the core set.From the publishing standpoint, expansions provide a lot of opportunity. Expansions can be produced more quickly and with less risk – you already have a core game system that works well, so you just need to add rules and test those, not make sure you’re balancing an entire game. And the game has a built-in audience of people who’ve purchased the original. Publishers can bring in a little extra cash flow by releasing expansions. Not to mention the fact that having to develop rules for a ton of expansion options to include in the base game takes time; time that delays production, delays getting the game to market – time that publishers can’t afford. Let them get the game out there, and if it’s popular, they can invest more time in expanding the game world for fans! It doesn’t hurt that a bit of “safe” income – a known target audience – can allow a publisher to take risks in other areas and create more new titles. Everybody wins! There will always be anecdotal cases of expansion packs that are just terrible, or games that launch to the public as essentially incomplete with an expansion pack released almost immediately that fixes the ‘problems’ of the base game. But those are exceptional cases, and to argue that those circumstances invalidate all expansions would be like saying because of Chutes & Ladders all board games are worthless pieces of tripe that no reasonable adult should be playing. You certainly don’t have to spend your money on expansions; buy what you want. If you love having all different sorts of games, have at it! Buy different titles to your heart’s content and your wallet’s chagrin! But expansions are great for people who want to invest more in their favorite games, who want to get fresh and new gameplay into the games they know, or who want to gradually introduce casual gamers into more and more complexity without intimidating them with all these new and unfamiliar gaming worlds. In short, the hobby world needs expansions for their games so that the hobby can grow and flourish, so we can love our games, and even so that publishers can continue to expand their own product lines to balance out risky investments in new titles with safer productions that almost guarantee income. QED. Supporting Wolfie’s point, I bought the El Grande Decennial Edition and haven’t cracked the expansions once. I’m not sure I ever intend to. I only buy expansions for games I play a lot, so I’d prefer to add elements gradually rather than buy all at once. I also have become better about skipping expansions. I have all the Dominion ones except Alchemy and Cornucopia, and I’m not sure I’ll go back for those. I never would have bought Dominion to begin with if I’d had to buy it all at once. This is a timely topic for me, so this was a really interesting read. We’re trying something completely new in the world of expansions, and Jason, I’m particularly interested to hear what you think of it after reading this post. I don’t want this to a be a self-promotional comment, so let me know if you need more details. I recommend talking to Jamey. He has very fresh ideas for the industry. I think expansions are mostly good, however, an expansion must justify its existence. How much cool stuff does it add, does it fix rule issues, does it offer more variety of play, and most important, if the original design was solid does it leave the core design that attracted players to it intact. Changing the core design may be an improvement, but generally it’s not. If you are doing so you must be able to justify it. If an expansion can weather these considerations it might be worth buying. Good points from both sides. Expansion to fix a broken game is definitely a terrible idea. Expansion to upgrade a good one – not so bad. If the base game still works well without it – there is no obligation to splurge. A “legacy mode” like that introduced by Jamey Stegmaier in Tuscany is good to make the experience organic. Although I also agree that Carcassonne folks really should’ve stopped before the Catapult. It is also fair from game designers to offer extra material at extra cost – we can’t expect elements that probably should’ve been there all along (evolution cards in King of Tokyo) to be added retroactively to a revised edition of a base game. Games that provide a base set of rules/mechanics applicable to a variety of pre-designed adventures (Mice&Mystics, Robinson Crusoe, Mansions of Madness) probably benefit most as these expansions offer completely new experiences in the setting that people already enjoy.